Although a large number of Argentinian players have found football success around the world, few have made a name for themselves in England's top league. 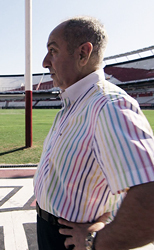 One notable exception is Ossie Ardiles. Fresh off Argentina's victory in the 1978 World Cup, Ardiles and his compatriot, Ricky Villa, joined Tottenham Hotspur later that year, when the notion of overseas players was still new to the English league. Helping lead Spurs to victory in the 1981 FA Cup, the Argentinian stars became cult heroes in England. But on April 2, 1982, everything radically changed as Argentinian troops descended on the British-ruled Falkland Islands, asserting rightful sovereignty. A conflicted Ardiles returned to Buenos Aires two days later, his bright future with Spurs suddenly in question. When I used to vacation in Cordoba in my childhood, I used to lie down on the floor to look at the stars in that clear mountain sky. We can't see the stars in the city. I clearly remember my surprise when my father told me that the sky was different in the Northern Hemisphere. I thought about the kids who were on the other side of the world watching another part of the universe with stars that I couldn't see. And perhaps Osvaldo Ardiles, lying down on the same place, years before, thought the same. What he never imagined was that not only he would see the stars from his house in London, but also he would turn out to be the most shining star in English Tottenham's sky. To talk about football in Argentina is to talk about our culture, our essence, our heart. The same thing happens in England, where this sport was born. That's why, after winning the World Football Championship in 1978, Ardiles decided to continue his career there. An imaginary bridge was built between these two worlds, so different yet so similar. That construction was destroyed when, in 1982, Argentinian forces landed on the Falkland Islands/Islas Malvinas. Osvaldo got to know about the death of his cousin when he had to defend the world championship title in Spain. Nothing would be the same. When I met Osvaldo for the first time in London, he knew I was proposing for him to open an old wound that not even time could make less painful. When he told me he wanted to tell his story, I realized that the field was not the only place he was brave in. Going to The Falklands for any Argentinean is a very difficult experience, but for one living in England, being a legend for the Tottenham´s supporters and who had lost a relative on the conflict, is still much more difficult. Being there, staring at the graves of the dead of both countries, the commitment became stronger. Physical barriers may always exist, but we can destroy mental and spiritual barriers that prevent us from considering things from a different point of view. We are all floating in a small blue sphere somewhere in the universe, traveling among stars, those seen from Argentina and England and, of course, from two small islands in the South Atlantic. Destiny had a surprise for us. When we thought that we were closing a circle with this documentary, we were just opening another one. We hope that we can transmit in this film all that this experience left in our hearts and rally more people to help build a bridge to a better place. Camilo Antolini is a partner and director for 100 Bares Producciones since 2005. He started his film career as an editor in the films "El mismo amor, la misma lluvia" (Same love, same rain), "El hijo de la novia" (The son of the bride) and "Luna de Avellaneda" (Avellaneda's Moon). He also worked as an editor on the multi award-winning series "Vientos de Agua" (Winds of Water). As editor, he won the Condor de Plata Award twice. Antolini continued his career as a director working for advertising campaigns for TCM, Ftv and ESPN, among others. He was a director and producer for the Argentinian comedy series "El hombre de tu vida" (The man for your life) (TELEFE / HBO 2011 - 2012), as well as for various documentaries and series, including "Capitales del Futbol" (Football Capitals) (ESPN 2010-2013). As a producer, he worked on the movies "Metegol" and "El secreto de sus ojos" (The secret in their eyes), the Academy Award winner for Best Foreign Language Film in 2010. He won the Martin Fierro and Tato Awards as TV director for "El hombre de tu vida" (A man for your life) in 2012 and 2013.